Biography of Italian Futurist Sculptor and Painter. Italian sculptor, painter, writer and printmaker, Umberto Boccioni was one of the principal figures of the Italian Futurism movement and one of the great twentieth century sculptors. In 1912, he published Futurist Painting Sculpture: Plastic Dynamism, which expounded his ideas on the relationship between form, motion and space. Despite the brevity of his life, dying at the age of 34, Boccioni's influence on sculpture continued to influence other artists many years after his death. His iconic masterpiece is Unique Forms of Continuity in Space (1913, original in the Museum of Contemporary Art in Sao Paulo, Brazil; casts in the Tate London, MoMA New York and elsewhere), a work which illustrates his theory of "dynamism", a concept he also explored in other works like: Synthesis of Human Dynamism (1912), Spiral Expansion of Speeding Muscles (1913) and Speeding Muscles (1913). Umberto Boccioni's works can be seen in several of the best art museums in Europe and America. Boccioni was born in Reggio Calabria, southern Italy in 1882. In 1897 his family moved to Catania on the east coast of Sicily where he completed his school diploma at a local technical institute. It was here, in Sicily, that a young Boccioni worked with local newspapers, creating prints and etchings. In 1901 he moved to Rome and studied at the University of Fine Arts (Libera Accademia di Belle Arti di Roma). While in Rome he met Gino Severini (1883-1966), an Italian painter, who was also to become a leading member of the Futurist movement. Severini was associated with neoclassicism before the First World War, working in a variety of media including mosaic and fresco. Severini and Boccioni became pupils of Giacomo Balla (1871-1958). Through Balla they came to learn about Divisionism, the optical colour theory behind Seurat's and Signac's Neo-impressionism. They also came into contact with Vittore Grubicy, the powerhouse behind Italian Divisionism (1890-1907). Boccioni then spent some time in Paris and Venice (at the Accademia di Belle Arti, Venice) before moving to Milan. In Milan Boccioni found a forward-looking city, which was not entrenched in old fashioned artistic styles. Here he met the artists Romolo Romani and Gaetano Previati who introduced him to Pointillism and Symbolism. He also became acquainted with the founder of Futurism and its chief theorist, the Italian writer Filippo Tommaso Marinetti (1876-1944). Frustrated with the various techniques of Post-Impressionism which passed for modernism in Italy at the time, Boccioni was constantly searching for a new way to express dynamic form. He naturally moved towards the Futurists, who were practising "modern art" in a variety of media including sculpture, paintings, graphic design, ceramics, interior design, industrial design, film, theatre, fashion, textiles, literature, music and architecture. The founder of Futurism, Marinetti, launched the movement with an article in 1909. He was soon joined by Boccioni and the painters Giacomo Balla, Gino Severini, Carlo Carra (1881-1966), and the painter and musician Luigi Russolo (1885-1947). The Futurists loathed everything old, especially in the arena of artistic tradition. Marinetti wrote: "We want no part of the past..." The Futurists admired technology, speed, industrial equipment, and everything that represented the triumph of humanity over nature. To learn how to evaluate modernist Futurist sculptors like Umberto Boccioni, see: How to Appreciate Modern Sculpture. For earlier works, please see: How to Appreciate Sculpture. Though primarily active as a painter for much of his short career, it was as a sculptor that Umberto Boccioni made his most important contribution to the history of art. While on one of his trips to Paris, he was seized with the idea of infusing sculpture with the modernity of Futurism. In 1912 he published his Futurist Painting Sculpture: Plastic Dynamism (Pittura scultura Futuriste: Dinamismo Plastico), and the following year he unveiled his masterpiece Unique Forms of Continuity in Space (1913). This semi-abstract sculpture depicts a striding figure, with billowing drapery around its legs, giving the sculpture an aerodynamic and fluid form. Although as a Futurist, Boccioni had no time for traditional plastic art, the work is still realistic and the lack of arms on the figure pays homage to Walking Man (1877, Rodin Museum, Paris) by Auguste Rodin. 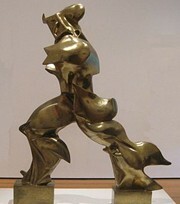 Boccioni's original work was made in plaster, and this is on display at the Museum of Contemporary Art, in Sao Paulo. Two bronze casts were made in 1931 and are on display at the Museum of Modern Art (New York) and the Tate Modern (London). The sculpture is now represented on the Italian 20 eurocent coin. Other sculptures Boccioni created in plaster (now destroyed and only known from photographs) include Synthesis of Human Dynamism (1912); Speeding Muscles (1913) and Spiral Expansion of Speeding Muscles (1913), as well as the bronze Development of a Bottle in Space (1912). Italian Futurism had a major influence on artists across Europe, including: the Vorticists in Britain, the Dada movement in Zurich and Berlin, Delaunay's Simultaneisme, Art Deco and Surrealism, while Russian Futurism had a strong effect on Rayonism and Constructivism. As for Boccioni himself, he joined the War and died in August 1917 after falling from his horse. Despite his untimely death, Boccioni is seen as one of the great sculptors of the 20th century, while his Unique Forms of Continuity in Space has become an updated version of the classical marble statue known as The Winged Victory of Samothrace (c.190 BCE, Louvre), and one of the iconic sculptures of the 20th century.  For more about the history and styles of plastic art, see: Homepage. © visual-arts-cork.com. All rights reserved.